Last Friday our ITEMP team worked all day in tight coordination with the Detroit Police Department on a kidnapped child human trafficking case. Our office received a call from an officer in their department asking for resources to get a kidnapped child home. She went on to explain that Zoie Jackson, 5, was taken from her school by her mentally ill mother, who does not have custody, while her father was in surgery. Over the next couple of days Zoie’s mother drove 1,300 miles to Texas attempting to cross the border to Mexico, but was apprehended by authorities before she could complete her plan. Zoie was put in the hands of Child Protective Services and spent days without her father. Desperate for resources, the Detroit Police Department reached out to ITEMP asking for help. 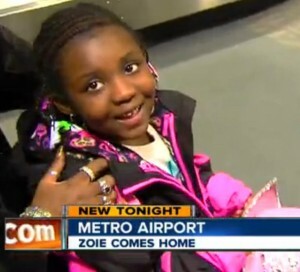 We immediately knew we wanted to bring Zoie Jackson home to her family. This time around fast action brought great results and Zoie was reunited with her father and grandmother! Now we need your help. Click here to DONATE NOW. Even small donations will help to defer the cost. Thank your so much for your support of Zoie Jackson and her family. Your contributions, prayers, and support make it possible for us to continue to help children like Zoie. To see Zoie reunion with her family check out the heart-warming story by WXYZ Action News, click here.